"Georgia Strait" redirects here. For the newspaper, see The Georgia Straight. The Strait of Georgia at centre, the Strait of Juan de Fuca below, Puget Sound at the lower right, Johnstone Strait at the extreme upper left. Sediment from the Fraser River clearly visible. The Strait of Georgia or the Georgia Strait is an arm of the Pacific Ocean between Vancouver Island and the extreme southwestern mainland coast of British Columbia, Canada and the extreme northwestern mainland coast of Washington, United States. It is approximately 240 kilometres (150 mi) long and varies in width from 20 to 58 kilometres (12 to 36 mi). Along with the Strait of Juan de Fuca and Puget Sound, it is a constituent part of the Salish Sea. Archipelagos and narrow channels mark each end of the Strait of Georgia, the Gulf Islands and San Juan Islands in the south, and the Discovery Islands in the north. The main channels to the south are Boundary Pass, Haro Strait and Rosario Strait, which connect the Strait of Georgia to the Strait of Juan de Fuca. In the north, Discovery Passage is the main channel connecting the Strait of Georgia to Johnstone Strait. The strait is a major navigation channel on the west coast of North America, owing to the presence of the port of Vancouver, and also due to its role as the southern entrance to the intracoastal route known as the Inside Passage. The United States Geological Survey defines the southern boundary of the Strait of Georgia as a line running from East Point on Saturna Island to Patos Island, Sucia Island, and Matia Island, then to Point Migley on Lummi Island. This line touches the northern edges of Rosario Strait, which leads south to the Strait of Juan de Fuca, and Boundary Pass, which leads south to Haro Strait and the Strait of Juan de Fuca. The mean depth of the Strait of Georgia is 157 metres (515 ft), with a maximum depth of 448 metres (1,470 ft). Its surface area is approximately 6,800 square kilometres (2,600 sq mi). The Fraser River accounts for roughly 80 percent of the fresh water entering the strait. Water circulates in the strait in a general counterclockwise direction. 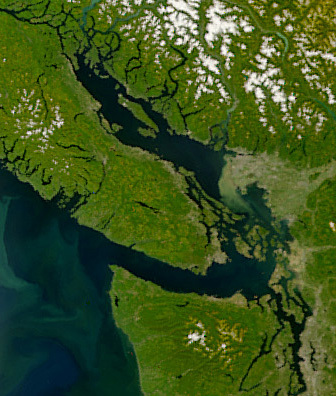 The term "Gulf of Georgia" includes waters other than the Georgia Strait proper, such as the inter-insular straits and channels of the Gulf Islands, and may refer to communities on the shore of southern Vancouver Island. As defined by George Vancouver in 1792, the Gulf of Georgia included all the inland waters beyond the eastern end of the Strait of Juan de Fuca, including Puget Sound, Bellingham Bay, the waters around the San Juan Islands, as well as the Strait of Georgia. Several major islands are in the strait, the largest being Quadra Island and Texada Island. First Nations communities have surrounded the Strait of Georgia for thousands of years. The first European exploration of the area was undertaken by Captain Jose Maria Narvaez and Pilot Juan Carrasco of Spain in 1791. At this time Francisco de Eliza gave the strait the name "Gran Canal de Nuestra Señora del Rosario la Marinera." In 1792, it was renamed for King George III as the "Gulf of Georgia" by George Vancouver of Great Britain, during his extensive expedition along the west coast of North America. Vancouver designated the mainland in this region as New Georgia, and areas farther north as New Hanover and New Bremen. The June 23, 1946 Vancouver Island earthquake shocked the Strait of Georgia region, causing the bottom of Deep Bay to sink between 3 and 26 m (9.8 and 85.3 ft). The two busiest routes of the BC Ferries system cross the strait, between Tsawwassen (south of Vancouver) and Swartz Bay (near Victoria) and between Horseshoe Bay (north of Vancouver) and Nanaimo. In 1967, the Georgia Strait inspired the name of Vancouver's alternative newspaper, The Georgia Straight , which has published continuously since. Towns and cities on the strait include Campbell River, Courtenay, Comox, Qualicum Beach, Parksville, Lantzville, and Nanaimo on the western shore, as well as Powell River, Sechelt, Gibsons, and Greater Vancouver on the east. Across the border in the United States, Bellingham, Washington and other communities also lie on the eastern shore. Other settlements on Vancouver Island (such as Duncan) and the mainland are separated from Georgia Strait itself by islands and lesser straits but are often spoken of as being in the Strait of Georgia region. A controversial idea has existed since 1872[citation needed] of a bridge connecting Vancouver Island to the British Columbia mainland. The first idea was to cross Seymour Narrows (which is farther north than the end of the Strait of Georgia) at Menzies Bay with a rail bridge for the then-proposed Canadian Pacific Railway to link Victoria, via Bute Inlet and the Yellowhead Pass, with the rest of Canada. Later proposals have focussed on bridging the Strait of Georgia itself, which is much wider than Seymour Narrows. A proposed modern road bridge connecting Greater Vancouver to Vancouver Island in the manner of the Chesapeake Bay Bridge Tunnel, has been discussed for decades, ever since the commencement of service by BC Ferries. Some crossing design suggestions include a partly floating, partly submerged tunnel to allow ship traffic to move freely. The hurricane-force windstorms of Typhoon Freda in 1962 and of December 2006 call into question the safety of such a project. Former B.C. cabinet minister Dr. Patrick McGeer, a research neuroscientist and a science advocate, has repeatedly advanced the proposal in recent decades. In a CKNW news item broadcast in August 2008, McGeer said he thinks the idea just needs "a visionary politician" to support it. McGeer still has the conceptual model of the bridge that was displayed at Expo 86. [not in citation given] The idea has formal opposition in the form of an Islands Trust policy banning the building of any bridges or tunnels connecting the Gulf Islands to the Mainland or Vancouver Island. In March 2008, the Chemainus First Nation proposed renaming the strait the "Salish Sea," an idea that reportedly met with approval by B.C. 's Aboriginal Relations Minister Mike de Jong, who pledged to put it before the B.C. cabinet for discussion. Making the name "Salish Sea" official required a formal application to the Geographical Names Board of Canada. A parallel American movement promoting the name had a different definition, combining of the Strait of Juan de Fuca and Puget Sound as well as the Strait of Georgia and related waters under the name Salish Sea. This latter definition was made official in 2009 by geographic boards of Canada and the United States. In October 2009, the Washington state Board of Geographic Names approved the Salish Sea toponym, not to replace the names of the Strait of Georgia, Puget Sound, and Strait of Juan de Fuca, but instead as a collective term for all three. The British Columbia Geographical Names Office passed a resolution recommending that the name only be adopted by the Geographical Names Board of Canada should its US counterpart approve the name change. The United States Board on Geographic Names approved the name on November 12, 2009 and Canada approved it in 2010. ^ Roberts, John E. (2005). A Discovery Journal: George Vancouver's First Survey Season - 1792. Trafford Publishing. p. 72. ISBN 978-1-4120-7097-3. ^ Gannett, Henry (1905). The Origin of Certain Place Names in the United States. Govt. Print. Off. p. 136. ^ "Strait of Georgia could be renamed Salish Sea". Canadian Press. CBC.ca. 2008-03-09. Retrieved 2008-03-10. ^ a b "STATE BOARD ON GEOGRAPHIC NAMES APPROVES 'SALISH SEA'". 2009-10-30. Archived from the original on 2013-10-30. ^ Berger, Knute (October 20, 2009). "Smooth Sailing for the Salish Sea?". Crosscut. Archived from the original on September 26, 2011. Retrieved August 13, 2011. ^ Berger, Knute (November 12, 2009). "U.S. approves Salish Sea name". Crosscut. Archived from the original on August 14, 2011. Retrieved August 13, 2011. Wikimedia Commons has media related to Strait of Georgia. Wikisource has the text of a 1921 Collier's Encyclopedia article about Strait of Georgia.